Optimising account performance to reduce CPC’s is an effective tool to improve account performance. CPC combined with budget determines how many clicks you can receive in any given period of time. If you have campaigns limited by budget but are unable to increase budgets, reducing CPC’s is really the only way to increase clicks. CPC’s are often limited by targets such as CPA and ROI targets, meaning that in order to achieve these targets the relationship between CPC, Conversion Rate and Conversion Value force specific CPC’s. For example; if you have a keyword with a conversion rate of 10% and a conversion value of $15 you cannot, on average, afford to pay more than $1.50 per click before you make a loss. Therefore if you had an ROI target of 150%, you could not pay more than $1.00 per click without exceeding the target and no less to avoid coming in over the ROI target. Thus CPC’s often sit within a small range determined mathematically (based on existing historical data). When and where relevant, run tests to see the impact of CPC’s on account performance. Contrary to the above description of the maths applied to calculate CPC’s; you can find that very high CPC’s in competitive areas that put your ads in the top three positions, often attract much more qualified clicks. We have run tests where drastically higher CPC’s has resulted in traffic with drastically higher conversion rates. This initially might seem counter-intuitive but it does often prove to be the case. 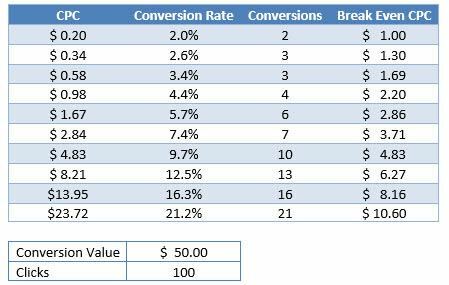 Whether those improved conversion rates are high enough to compensate for the higher CPC’s is what testing can help to determine. In the above scenario, the CPC would need to be less than $4.83 to start turning a profit. Average CPC can refer to the average for a single keyword or a whole account; in either case if more than one Click has been acquired an average can be established. The actual CPC may vary between keyword, campaign or between Clicks for a single keyword. 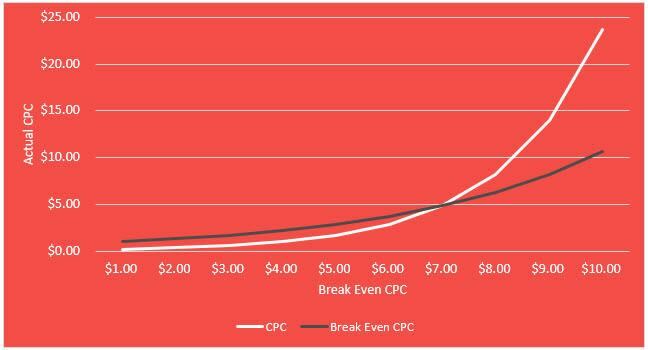 If a keyword had two Clicks with two actual CPCs of $0.50 and $0.70, the average CPC of that keyword would be $0.60. Hence, when considering Avg. CPC it is important to consider what networks, devices, campaigns, etc the average is being calculated from. An average CPC that includes both mobile, desktop, Display and Search traffic will have less meaning than an Avg. CPC that includes just one of these. Avg. CPC can vary between network, device and branded vs. Non-branded terms, it is often best to segment account data to look at Avg. CPC. This becomes more relevant where the difference in CPC’s is larger or where one segment skews the results too much. Avg. CPC can be seen in any report by default that contains both Cost and Click columns. Avg. CPC can also be seen at all levels from account down to ad or placements.